Heads up BPI cardholders! Cebu Pacific promo as low as P499 one-way base fare up for booking. The ongoing Cebu Pacific Super Seat Fest are exclusively for BPI card holders: Credit/ Debit. 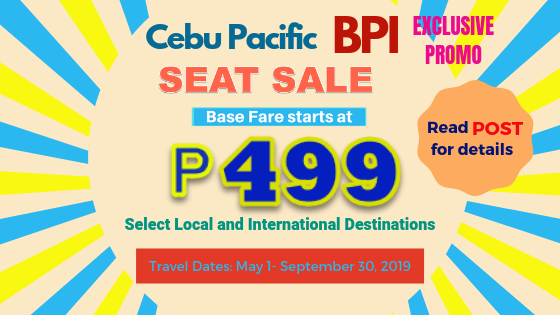 Cebu Pacific promo tickets start at P499 base fare on select domestic trips and P732 base fare for international flight. Take note booking for this promo in only until March 19, 2019. Use the Promo Code: CEBXBPI to get the sale ticket. 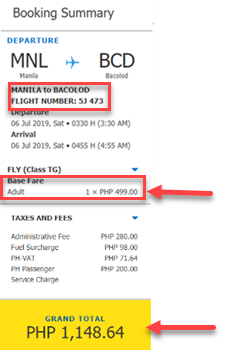 The Cebu Pacific- BPI promo fares good for travel from May 1 to September 30, 2019. To get the promo fares, you must book online at www.cebupacificair.com and key in the Promo Code: CEBXBPI. As the seat sale are exclusive for BPI Cardholders, payment of ticket must be made thru your BPI Credit/ Debit Card. You need to have your BPI card when booking. Card details such as: card #, validation number, expiry date (month/year), Cardholder name, billing address, contact number and email address are to be inputted to book ticket. 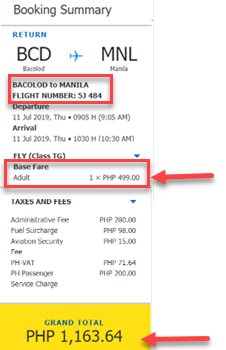 Quoted Cebu Pacific sale ticket are base fare promos and exclude Web Admin Fee, Fuel Surcharge, taxes, Aviation Security Fee and Terminal Fee. Promo fares cover up to 7 kilos hand carry baggage. Not a BPI cardholder? Just wait for more Cebu Pacific, Philippine Airline and other airline seat sale which we will share in our Facebook: PISO FARE TICKET!